Hi there! 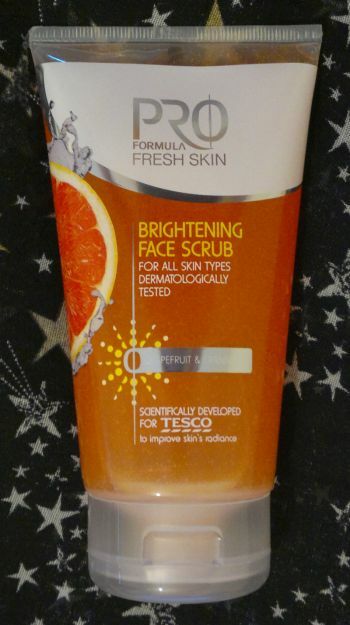 Today’s review is about Tesco’s Pro Formula Fresh Skin Brightening Face Scrub. This product contains salicylic acid, vitamin C, and grapefruit and cranberry extracts. And it promises to enegise, brighten, exfoliate and purify skin. How’s the scrub? I think it’s quite good! It’s effective but also gentle. I can see and feel that it exfoliates my skin properly, but it doesn’t feel too harsh. Cool! The mixed fruits fragrance isn’t very spectacular, but it’s not unpleasant. It’s perfectly alright – so I have no reason to complain. Tesco’s Pro Formula Fresh Skin Brightening Face Scrub is £3 for a 150ml tube.